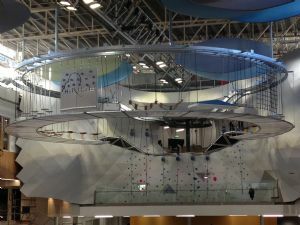 Aerial Adventures Limited open the UKs first indoor Aerial Adventure Obstacle course at East Kilbride Shopping Centre. The 19 piece obstacle course manufactured by Angus Firth Design, is suspended 8mtrs high above an ice rink, for an experience sure to thrill. See our Facebook page for further details.